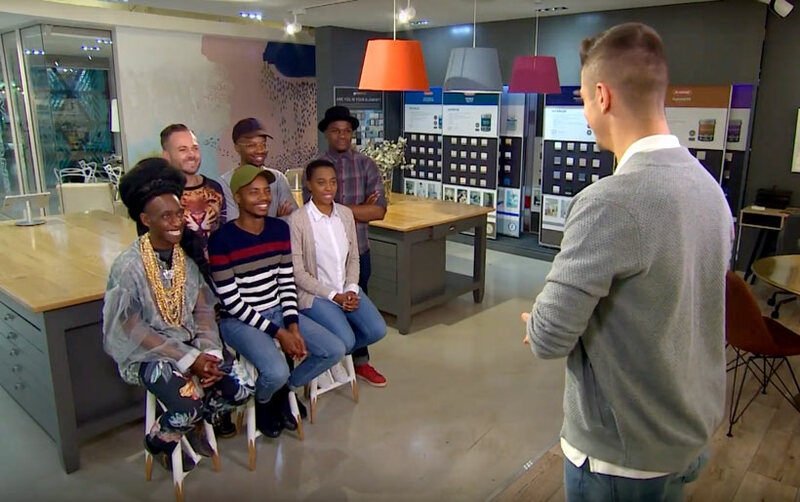 The competition kicked off in earnest as our design duos learnt they’ll have two weeks to decorate each space and transform their empty homes into dream homes. Their first challenge is decorating the guest bedroom and make it comfortable and accommodating. The guest bedroom is often overlooked and overshadowed by the master bedroom but it’s still an important space. This challenge sets the tone for the overall design of each of the homes and will show the early front runners in the competition. First, each team met with their magazine mentors to discuss their design. Team House and Leisure put forward a modern scheme incorporating colours of peach and emerald. Their unique use of Caesarstone will be in the creation of an open wardrobe as well as above the bed. Their furniture will be neutral and, overall, their design has a feminine, restful feel. The team will be collaborating with an artist and Banele will create a piece that will also be part of the wall decor. Tiaan approved their design and his only suggestion is they plan collaborations well in advance. Team Visi met on site with their mentor, Annemarie, to explain their “Modern Jungle” design plan for the guest bedroom. Annemarie commended the team on creating a fictional client which will help guide their design for the entire house and ensure it’s cohesive. Their first choice for the guest bedroom was a vibrant wallpaper but their test paint colour doesn’t match. After choosing a new shade of Plascon paint, the team confidently show their choice of flooring, furniture and accessories. Team Habitat make the surprising and bold decision to knock through a wall and create a doorway between the guest bedroom and the neighbouring bathroom. While the dramatic change happens in the house, the duo head out shopping. Sadly, their mentor Amanda had a medical emergency and sent a trusted colleague in her place to advise the duo on their design. In their search for lighting, Abiah’s eyes are clearly bigger than the budget as he wants an R80,000 lamp. Thankfully, Brad is in charge of the budget and they compromise on a more affordable lighting option. The duo’s modern African theme is definitely off to a roaring start. Meanwhile, Team House and Leisure visit Plascon spaces for practical advice on the paint effect they’ll be using in their room. They’ll be combining peach and emerald to get an ink faded look on their feature wall. The duo also select their Caesarstone products and will be using contrasting light and dark stones. They also do a little shopping trip to the Oriental Plaza where they chose the fabric for their curtains. Team Habitat also choose their stone surface which will be used in grand style. Brad wants to use it as a feature slab against the wall while Abiah wants pillars in the room and only time will tell which option will make it into the room. Team Visi embark on an exciting collaboration where Mpho’s keen interest in furniture design sees them reimagine a popular piece by Leonardo Design as side tables. Although it normally takes three weeks for construction, their gold piece will be done in the record time of just one week. Team Habitat are also collaborating with street artists who have beaded two halves of a zebra. The unconventional art piece will become a seat that will look like a zebra standing in their guest bedroom. Another unconventional choice in their room will be artificial grass as flooring. Taking a moment away from the competition, Jeannie discusses different property options within estate living with Lisa Boniface. Lisa explains that sectional title property is increasingly popular in estate property purchases. Homeowners must also be aware of the rules and regulations of the estate in which they buy and do their homework when looking into purchasing in an estate. Freehold property ownership is different in that the owner has full title of both the land and the building on it. The owner is responsible for maintenance and insurance of the land and building whereas with sectional title ownership, the body corporate looks after common land areas. Each type comes with pros and cons: freehold property owners have free reign to make changes to the structure while sectional title owners will have to abide by rules and request consent from the body corporate. Sectional title owners also automatically become members of the body corporate of the estate in which they buy. Ultimately, buyers should research both options fully and make use of whichever suits them best. At the halfway mark of the first design challenge, each team is at different stages. Team Habitat is farthest from completion because of their choice to smash through the wall. No painting or flooring installation has been done but their furniture has been chosen and will arrive in time. The big question is whether or not this room will be finished for judging. Team Visi has their floor installed and their room is halfway painted. But, their ceiling and cornices still need to be done and the wallpaper installed. At this point, they are confident they’ll complete the room by the deadline. Team House and Leisure pull up to the halfway mark with an intern from the magazine helping them with a big challenge: Transport. Neither of the gents in the duo can drive so, they got themselves some help in the form of a driver. As for their room, the paint effect is tougher than they expected and quite time consuming. With time running out, Team Visi is literally having to watch paint dry as the slow progress on the walls delays their wallpaper installation. The heat is on as they might not complete their room until the last minute. The competition kicks off in earnest as the design duos are briefed to decorate the guest bedroom.